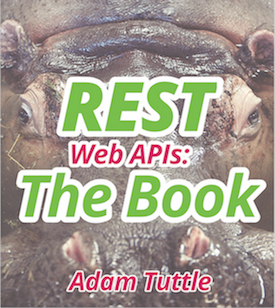 This book review of Adam Tuttle's "REST Web APIs: The Book" explains how the author practically and succinctly explains REST concepts. Before I begin, a quick disclaimer. I’ve known Adam for a long time, so my review may be a bit colored by the fact that I’m friends with him. Of course, the flip side to that is that on more than one occasion I’ve fought with him over something or another on IRC so this could be my chance for revenge. That’s my official disclaimer out of the way. Adam’s REST book is a good example of a trend I’m seeing lately in smaller, more concise technical books. I’ve read, or pretended to have read, huge tomes on programming languages before, heck I’ve even contributed to a few, but frankly, I’m finding that the shorter, more direct books are a heck of a lot more effective. His book is right over a hundred pages and as it is all on the theory of REST, you can read it in one or two sittings. I say “theory”, but to be clear, this is an incredibly practical book. Adam doesn’t just explain REST, but goes into details and gives you real nuggets to chew on when thinking about why REST does things a certain way. He is also not shy about calling out what isn’t practical and being clear about why and when he breaks the rules. This comes through especially well in his best practices chapter. Obviously this is an opinionated section, but it is also something you don’t see often in books of this type. Frankly, I want to see more of this. You may not agree with the author, but it is helpful to have someone with real world experience tell you their opinion on what works best with them. I really enjoyed the book and definitely recommend it. To be honest, REST has always felt like a “nice” idea, but not necessarily worth the effort. After reading Adam’s book, I’m more convinced now that it is worth my time and part of what should be considered a requirement for building a decent API. You can pick the book up for 19 American dollars at the official book page here: REST Web APIs: The Book. You get a PDF, Mobi, and ePub version. You can also grab a sample chapter to see if it looks worth your time.